There is big trouble at both Poles. Veteran Antarctic scientist Richard Levy tells about the double threat driving Antarctic ice into the sea – to flood coastlines around the world. From Korea, scientist Malte Stuecker: why the Arctic is warming faster than the rest of the world, disrupting weather over the Northern Hemisphere. 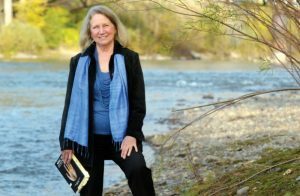 But first “Why We Won’t Quit the Climate Fight” by well-known American writers and activists, Kathleen Dean Moore, Oregon State University, and SueEllen Campbell from Colorado State University. I open this show with two well-known American writers and activists: Kathleen Dean Moore from Oregon State University, and SueEllen Campbell from Colorado State University. They read from their article “Why We Won’t Quit the Climate Fight” as published in the Earth Island Journal, January 14, 2019. Sometimes the original voices can bring more than print (says the radio guy). I appreciate Kathleen and SueEllen doing this for Radio Ecoshock listeners. When it comes to sea level rising by feet or meters, the biggest fear is melting mountains of ice piled up on Antarctica. Recently NASA scientist Eric Rignot told us those glaciers are melting six times faster now than in the 1950’s. In another just-published paper, scientists discovered the marriage of two forces making that happen. This could determine the future map of the world, as disastrous sea flooding invades farmlands, cities, and whole nations. The science is challenging. It involves a 34 million year history of Antarctic ice, tiny single-celled animals, carbon dioxide, and the astronomical place of Earth in space. All of that. Fortunately we have the lead author Dr. Richard Levy here to help. 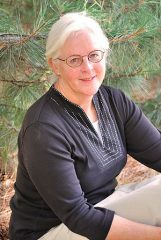 Dr. Levy is a Paleoclimate Scientist and Programme Leader at New Zealand’s GNS Science, a government Crown Corporation. Levy is a veteran of scientific expeditions to Antarctica, with many papers about the coldest continent on Earth. 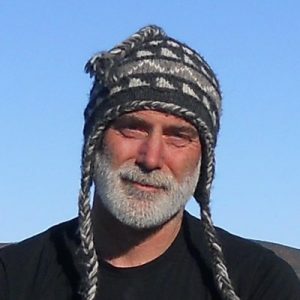 He is the co-author of the paper “Antarctic ice-sheet sensitivity to obliquity forcing enhanced through ocean connections” as published in Nature Geoscience 2019. Normally I recommend listeners go straight to the science published in the journals. In this case, I think you should start with a great summary published at phys.org: “Antarctic ice sheet could suffer a one-two climate punch” published January 14, 2019 by Terry Devitt, University of Wisconsin-Madison. Frankly, without understanding scientific terms like “obliquity”, you might miss the importance of Levy’s work without this article by Devitt, and my Radio Ecoshock interview. 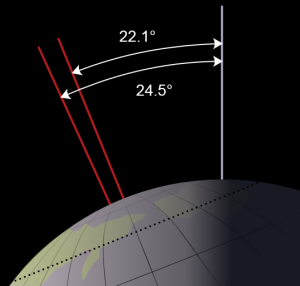 Specifically from that theory, the paper discussed in the Radio Ecoshock interview by Levy deals with Axial tilt, or “obliquity”, as one of many forces acting on the Antarctic glaciers, relative to human-induced heating..
“The angle of the Earth’s axial tilt with respect to the orbital plane (the obliquity of the ecliptic) varies between 22.1° and 24.5°, over a cycle of about 41,000 years. The current tilt is 23.44°, roughly halfway between its extreme values. The tilt last reached its maximum in 8,700 BCE. It is now in the decreasing phase of its cycle, and will reach its minimum around the year 11,800 CE. Increased tilt increases the amplitude of the seasonal cycle in insolation, providing more solar radiation in each hemisphere’s summer and less in winter. However, these effects are not uniform everywhere on the Earth’s surface. Increased tilt increases the total annual solar radiation at higher latitudes, and decreases the total closer to the equator. In other words we last visited the most extreme tilt just after the first human implementation of agriculture, and will hit the least extreme tilt 9,781 years from now, in the Common Era year 11,800. Do the glaciers of Antarctica tend to form at the time of maximum tilt, and retreat at minimum tilt, or visa versa? We are half way to somewhere astronomically and glacially, but half way to where? The whole journey from least tilt to greatest and back takes 44,000 years. That is the “cycle”. Our current pendulum swing takes about 22,000 years. But is the current state of tilt is decreasing, which is supposed to lead to an over-all cooling trend, why do we appear to be heading out of an Antarctic ice age, instead of into one? Has the carbon dioxide Earth blanket overpowered a weaker effect of axial tilt (obliquity)? Levy tells us we are more or less in the middle of that cycle, with still enough tilt to help amplify other sources of warming. If we could wait another 10,000 years, the tilt factor might help cool Antarctica, slow melting, and thus slow sea level rise. Sadly, our impacts are ramping up in this century, much less thousands of years. We can’t wait for our position in space to improve. This whole question invites the pit-fall of “a little learning is a dangerous thing”. A climate doubter reading just the science of obliquity could use it as a hammer to claim we are heading toward a new ice age, due to our decreasing tilt toward the sun. Buy there are also concurrent mitigating factors, including our procession in a different 25,000 year long cycle involving changes in the axis of rotation relative to the fixed stars. Wikipedia entries can be misleading in other ways (though I love Wiki as an entry way to any subject). For example, Wikipedia covers a “mass extinction event” in the Mid-Miocene period, around 14 million years ago. But Levy tells us they consider that time more as a “pulse” event. There were big changes in the biosphere, during a relatively rapid cooling, but while many species went extinct, many new species were formed as well. A “disruption” is closer to it. Still, we can learn a lot by how the climate/Earth systems react to rapid climate changes, whether cooling or warming. That is a subject I hope to develop in a coming program. For example, we know a little bit how the Aboriginal people of Australia coped with a one-two punch of incredible rising seas followed by a cold age that lasted more than a thousand years. A warming event led to a rapid cooling before more warming. Stay tuned. As for Richard Levy on this new paper, he tell us: “That’s the key outcome of these studies: Antarctica turns out to be way more sensitive to climate change than was previously thought.” And the key, key factor is the state of Antarctic sea ice. That southern pole sea ice was staying strong, even growing a little since 2014. Since then, Levy tells us, it has begun a decline every year, likely including this one. The sea ice serves as “buttress”, a block that slows down the flow of Antarctic glaciers into the ocean. As you know, when sea ice melts it is like an ice-cube in your glass because sea ice does not raise sea level. But ice from the big glaciers, that can put sea levels up at least 20 meters, or 75 feet higher. Imagine that. Richard Levy says their data suggests that in previous times, when the world was 1.5 degrees warmer (than pre-industrial) – sea levels were 6 to 9 meters higher than they are now. We may already have a long way to go, as the seas relentlessly rise over the next centuries. We know from the study led by Eric Rignot, our guest last week, that Antarctica is already losing ice mass, at a rate 6 times greater than in the 1950’s. Antarctica is melting. It will melt even faster is the sea ice there continues to shrink. Another feature of this paper is it provides a double-checked visual graphic of the last 34 million years of the Antarctic ice sheet. That time map can be used by a lot of other scientists, and amateur climate bloggers like myself. It’s cool to know the long history of that strange part of the planet. In the Arctic darkness of February 2018, there was an extreme heat event at the North Pole. The temperature was over 30 degrees Fahrenheit, over 17 degrees C, above normal. That is part of the amplified Arctic warming that crashed the summer sea ice, and started the great melt of polar glaciers. It changes everything. New science is struggling to explain why it is happening in the Arctic. Researchers from China, the U.S. and Australia worked on a breakthrough paper published last November in the journal Nature Climate Change. Here to explain the surprising findings is the lead author, Dr. Malte Stuecker. The paper is: “Polar amplification dominated by local forcing and feedbacks“, published November 19, 2018. In a way, Malte is representative of the global nature of climate science these days. 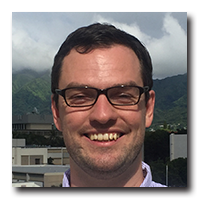 After an education in Germany, Malte got his PhD at the University of Hawaii. Following a position as a NOAA Climate & Global Change Postdoc Fellow, he is now a Research Professor at the IBS Center for Climate Physics [ICCP], at Pusan National University, Republic of Korea. There is a secondary result from this paper which could be controversial. The paper says, quote: “Thus, reducing radiative forcing at the pole may be a more effective policy to minimize Arctic amplification than previously thought.” I could read that as saying that solar radiation management, like spraying sulfate aerosols in the Arctic, might be effective, because of the local nature of the problem. So yes, increase in global warming will also warm the Arctic, but toward a more uniform way. That general increase in warming is not enough to explain the amplification of warming in the Arctic. Heat processes within the Arctic are responsible for the amplification. “In the tropics – fueled by high temperature and moisture – air can easily move up to high altitudes, meaning the atmosphere is unstable. In contrast, the Arctic atmosphere is much more stable with respect to vertical air movement. This condition enhances the CO2-induced warming in the Arctic near the surface. In the tropics – due to the unstable atmosphere – CO2 mostly warms the upper atmosphere and energy is easily lost to space. This is opposite to what happens in the Arctic: Less outgoing infrared radiation escapes the atmosphere, which further amplifies the surface-trapped warming. While Malte was here, I asked him about a couple of previous papers he co-authored. You can find a list of his research here. For example, many of us are worried the planet will not be able to feed billions of humans if Earth warms beyond the tolerance of major food crops. His August 2018 paper suggested rice may hit that heat ceiling this century, in the Philippines, and in Asia, rice is everything. Most climate science worries about positive feedbacks, the interactions that heat the planet even more. But Malte participated in a paper in Nature Climate Change that found a negative feedback. However Malte disagrees with that “negative feedback” label. Check out our interview to find out why. In any event, the scientists found a warming Atlantic Ocean could lead to a cooling force in the Pacific. Malte explains. I say: “We gotta get through the short-term before we get to the long-term.” Malte agrees, saying there is a lot of effort now among climate scientists to create ten-year (decadal) predictions, especially for regions. People live locally, and climate change develops locally. The shift is not really “global” other than the global atmosphere. Some areas will be hit with massive climate change first, while other areas seem to sail along for a while closer to “normal”. I think just that factor will make it more challenging for humans to agree on the need for action. On the other hand, some places that have been hit hard by climate-driven events (like Sandy, Houston, and now Australia) can still develop a politics of climate denial. Sometimes when humans feel most threatened, they may seek out authority and try to go back to the past, both of which can be self-defeating. We are out of time. But we won’t quit the climate fight. Please support this program if you can, and join me again next week for more Radio Ecoshock.